When does a metal stop being metallic? When do atoms start breaking the rules of chemistry as we know them? To the naked eye, and at room temperatures, such quantum phase transitions are not visible and not allowed. But when you cool certain materials to just shy of absolute zero and observe them at the atomic level these curious physical phenomena present interesting and peculiar behaviors. Why? For one, at near-zero temperatures, these behaviors aren’t influenced by changes in heat levels — unlike the gas-liquid-solid transitions we see every day. Another reason: the sheer complexity of the interactions between various particles in an environment governed by quantum mechanics, in which a particle also is a wave, multiple particles can correlate over distance and occupy several states simultaneously. The calculations are beyond the ability of any conventional computer. 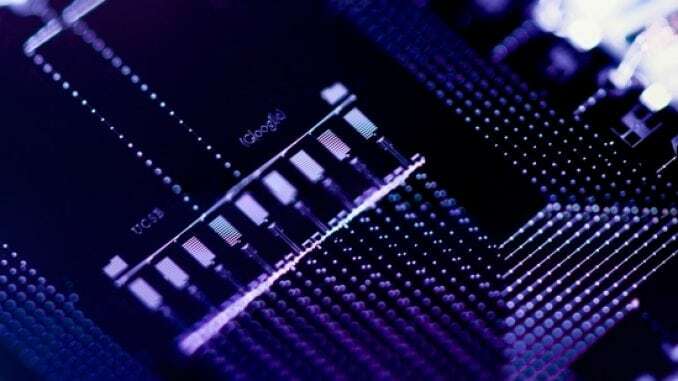 However, the Google/Martinis Group, teaming up with researchers from the Centre for Quantum Technologies at National University of Singapore (NUS), has devised a method for investigating quantum phases of matter. 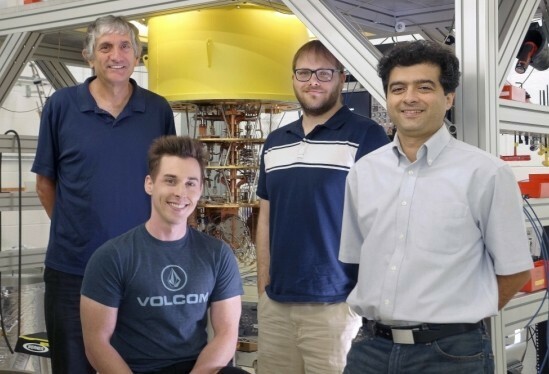 To do so they are using a chain of nine superconducting quantum bits (qubits) and spectroscopy, which measures light, to study the energy levels of a system. 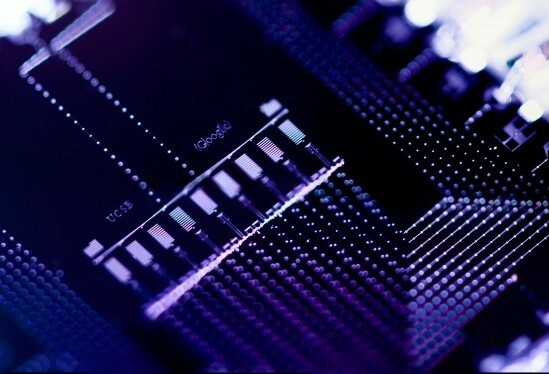 The computational processing power of quantum bits (qubits) is poised to have profound impacts on the diverse fields of science and engineering. 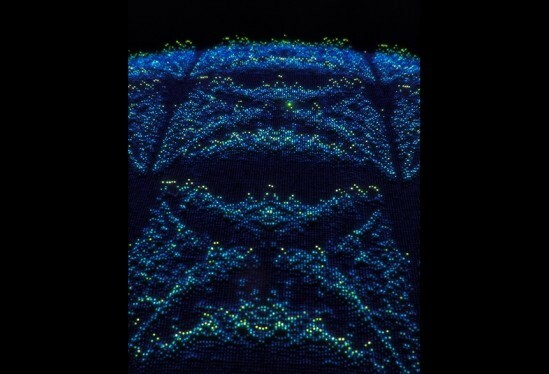 Using nine superconducting qubits, researchers at Google and the Centre for Quantum Technologies in Singapore were able to simulate the intricate energy spectrum predicted for 2D electrons in a magnetic field, the Hofstadter Butterfly. This graphic is based on experimental data. Photo Credit: VISUAL SCIENCE AND GOOGLE, INC.
Their work, “Spectral signatures of many-body localization with interacting photons,” appears in the journal Science. “A quantum computer can do any computation that you ask for,” Roushan said. For this demonstration, the researchers chose to tackle the issue of many-body localization, a situation in which the many interacting bodies (in this case, electrons) lose their ability to propagate through a medium. In metals, which are superconductors, this would result in the loss of one of their defining aspects and turn them into insulators. “This was known after Philip Anderson predicted it in the late 1950s,” Roushan said of the phenomenon known as Anderson localization, which occurs when there is enough disorder (randomness) in a system to interrupt the movement of electrons. In solid metals, identical atoms are arranged in a “lattice” of (ideally) regularly repeating uniform structures that allow the particles to move with minimal energy spent. “But say you start taking atoms out of the lattice and replace them with some foreign atoms,” he explained. “It becomes a very jagged landscape and electron conduction cannot happen.” Replicate this in a system, and you have a many-body localization situation. Enter spectroscopy, or the use of light to assess the composition of a material, be it a distant planet or the soft tissues of our bodies. The electrons of different types of atoms absorb and emit light (photons) at different wavelengths depending on the atom’s allowable and discrete energy levels, giving each material a unique spectral signature. “It has been predicted in the last 10 years that there would be a spectral signature for a system with metallic properties — where there is conduction — and systems that become insulators, where there is no conduction,” Roushan said. In a process akin to musicians striking a tuning fork and listening for the main note, the researchers “hit” their nine-qubit system with photons and waited as the system evolved to reveal its fundamental frequencies. “One of the most fundamental postulates of quantum mechanics states that if a system starts in a non-eigenstate, it will evolve in time according to the Schrodinger equation,” said Dimitris Angelakis, who specializes in quantum optics and many-body physics at NUS. A system out of equilibrium, he added, is expected to eventually find some kind of equilibrium (“thermalize”) relative to the inherent characteristics of the system. This superconducting chip, with a total area of one square centimeter, consists of nine qubits in a 1D array. Microwave pusles are applied to control their states and their interaction, and consequently control the dynamics of the system. Such Josephson-junction based superconducting systems are a leading physical implementations for quantum computation and simulation processing. Photo Credit: ERIC LUCERO/GOOGLE, INC.
On the other hand, many-body localization, Angelakis explained, is a situation where energy and information does not diffuse over time. The spectral signature of an evolving, thermalizing system, according to the researchers, would be different from one experiencing many-body localization. 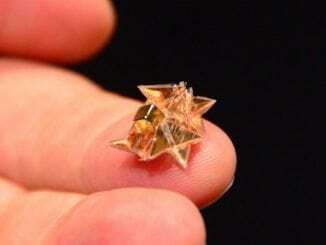 To demonstrate and benchmark their highly tunable nine qubit platform, the researchers caught a butterfly. That is, they used their system to simulate the complicated motion of electrons under a magnetic field, as predicted by physicist Douglas Hofstadter in 1976. Having demonstrated their control over the system, they then introduced two photons, while drastically increasing the system’s complexity and also programming increasing levels of irregularities and disorder. “By putting two photons in you had a problem of 45 energy levels and these 45 levels would interact and push each other out of the way,” Roushan said. Several photonic strikes in different places yielded multiple sets of frequencies. In music, the musicians would then use the dominant notes, or frequencies, as guides. So, too, did the researchers with the spectral vibrations generated by each hit of the qubit system, which they then transformed into their component frequencies to determine what energy signatures emerged as a result of increasing levels of disorder. In a low-disorder system, Roushan said, energy levels remained discrete, repelling each other, and were evenly distributed across the chain. But as disorder increased, the energy levels become uncorrelated and independent of each other. With their embryonic quantum computer of nine qubits, the researchers are only scratching the surface of what a full-sized quantum computer could do. However, according to co-author and UCSB researcher Charles Neill, this development proves that problems that have been out of the reach of current computational power — such as the multitudes of simultaneous interactions between quantum particles under varying levels of disorder — are now possible to approach. “It touches on really fundamental physics,” he said, “and we can really start to embed lots of different physical problems.